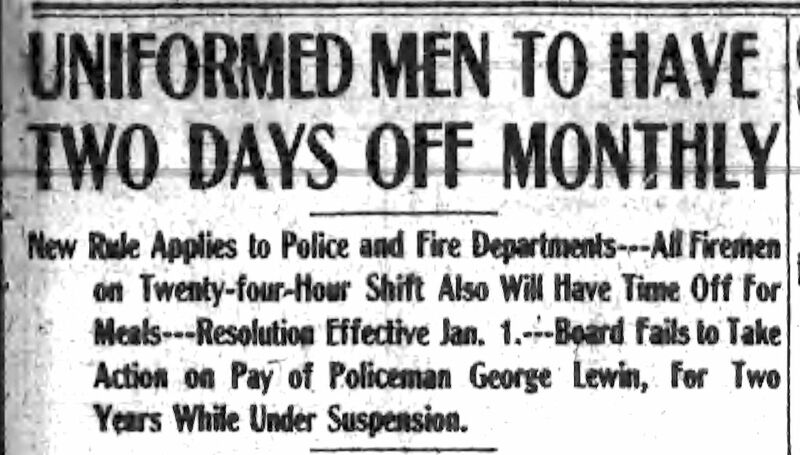 July 4, 1920: The department becomes completely motorized as a new Electric (battery powered) Tractor 75' aerial is put in service at Truck 3 on Godwin Avenue. 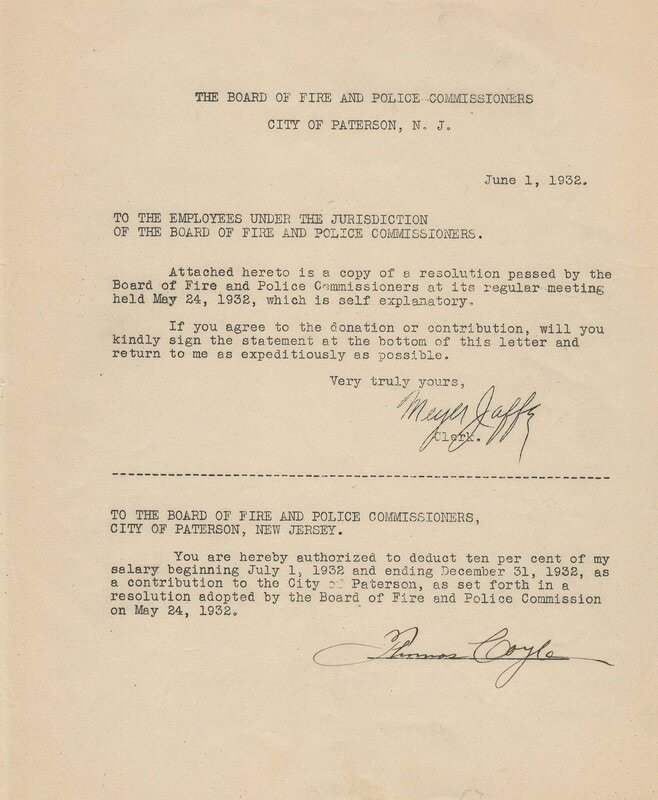 The last alarm response in Paterson using horses was Station 634 (East 18th Street and 3rd Avenue) for a fire at 755 River Street. 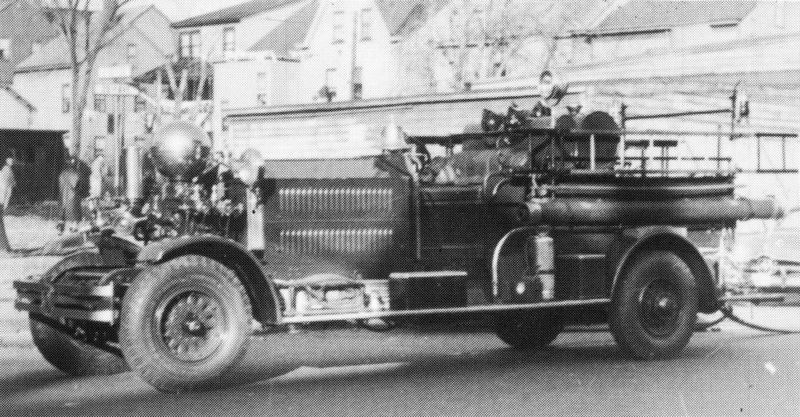 September 23, 1926: The Ahrens Fox Era in Paterson begins with the acquisition of a new 1000 GPM pumper with solid rubber tires which is assigned to Engine Company 5 at 115 Van Houten Street, shown below at a fire scene. 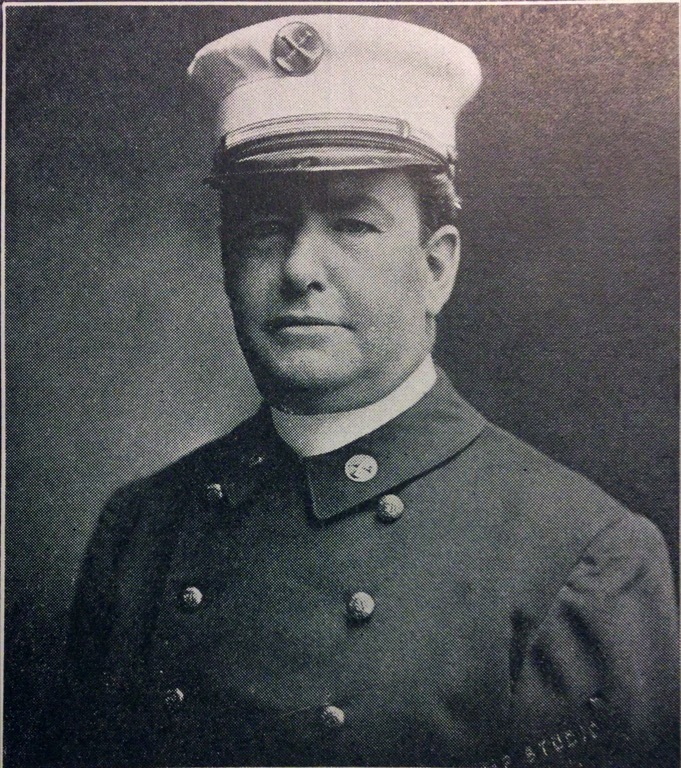 September 11, 1926: Captain John Breen completes 39 years of service appointed in 1897 becomes the FF with longest tenure of service. 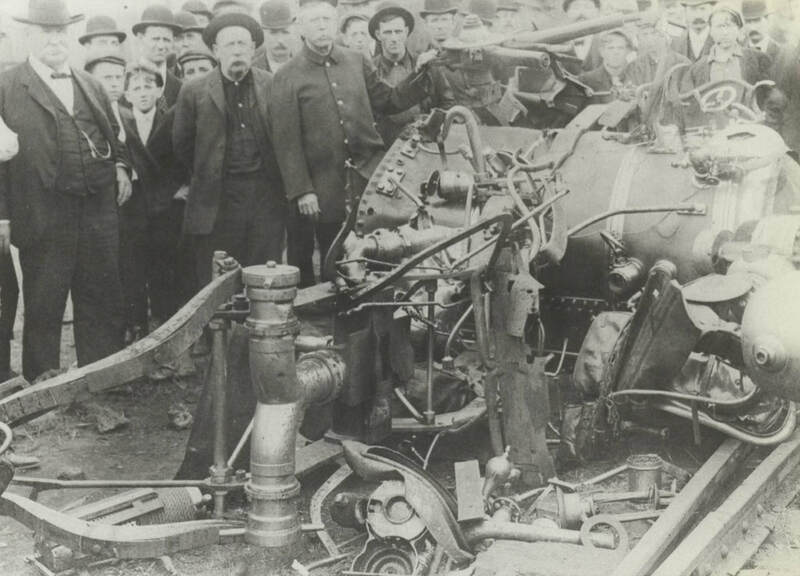 Started at Engine 2, then Chemical Company, then ultimately at numerous companies: Engine 1, Truck 3 (fought 1902 conflagration), Engine 6, Engine 5, Engine 7 (see train wreck below) and Engine 3. 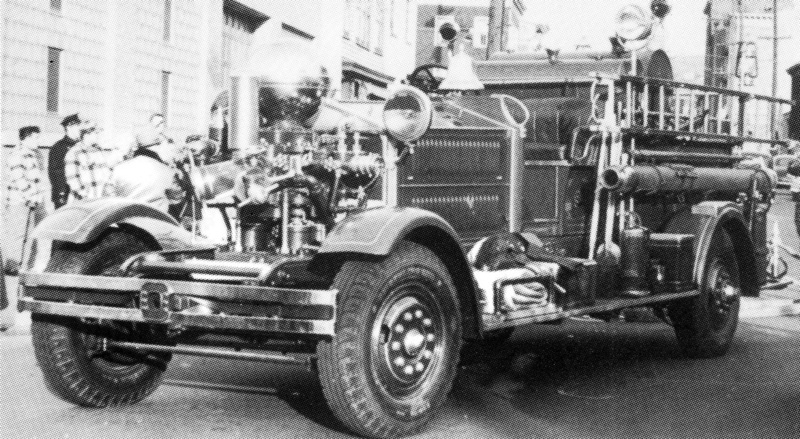 October 15, 1926: New Ahrens Fox 1000 GPM pumper acquired for Engine Company 4 on Slater Street. Also had solid rubber tires as well as a deluge gun on left side of hosebed. 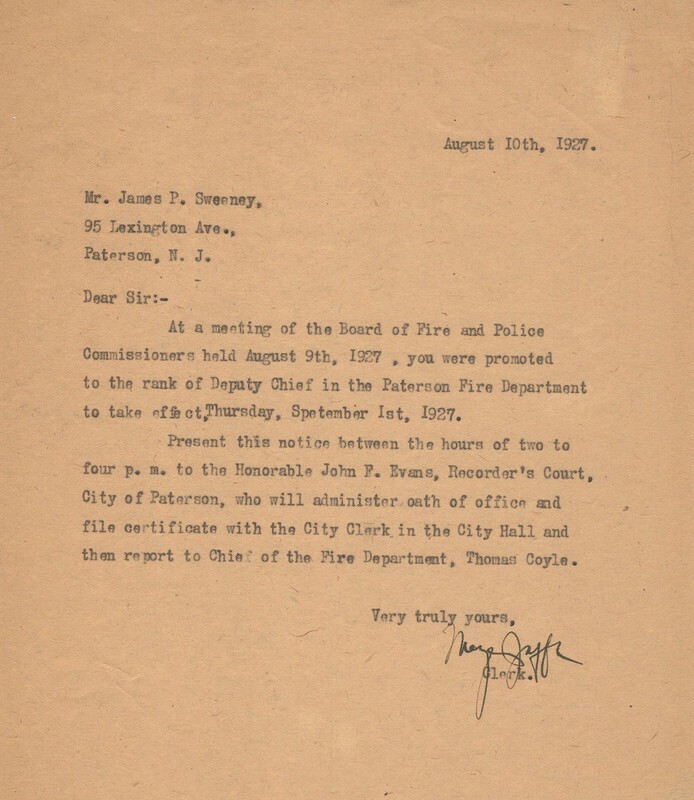 September 1, 1927: Following in his father's footsteps (Patrick) James P. Sweeney becomes a deputy chief. 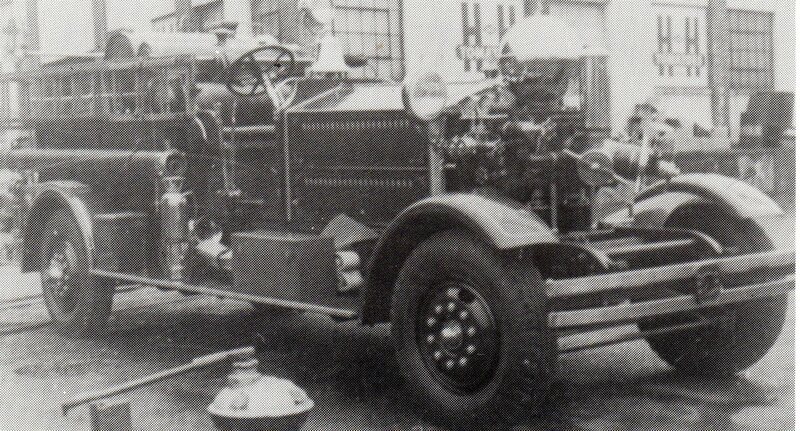 December 1927: Two new Ahrens Fox 1000 GPM pumpers with pneumatic tires acquired and assigned to Engine Companies 1 and 8. 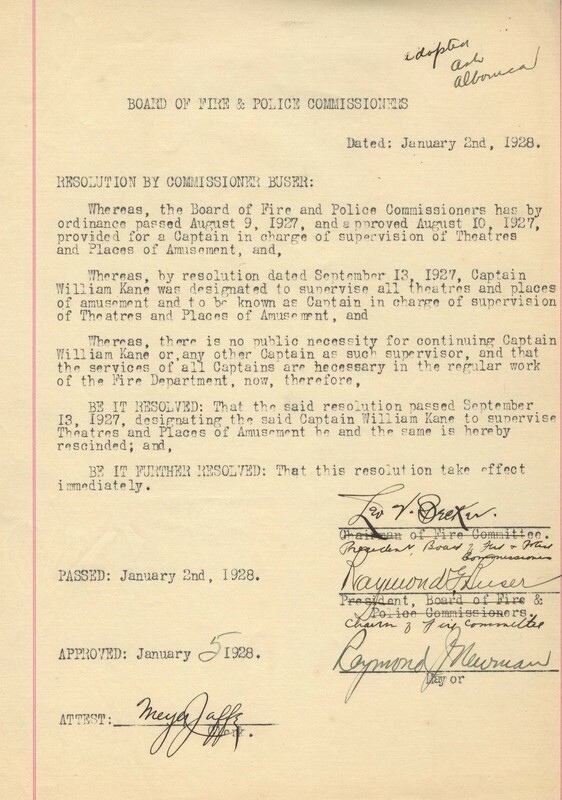 January 2, 1928: Board of Police and Fire Commissioners provided a Captain (William Kane) to supervise the Theater and Places of Amusement Division. 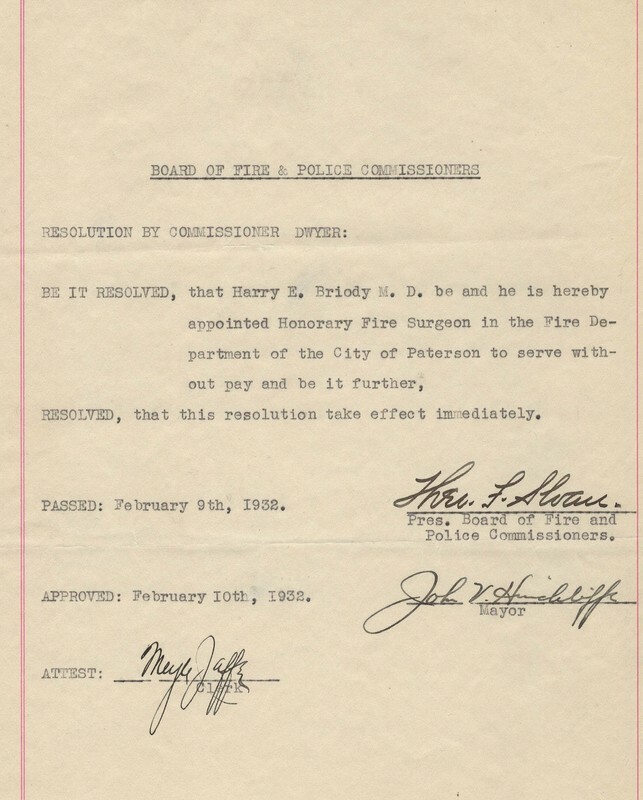 Here the order is rescinded. 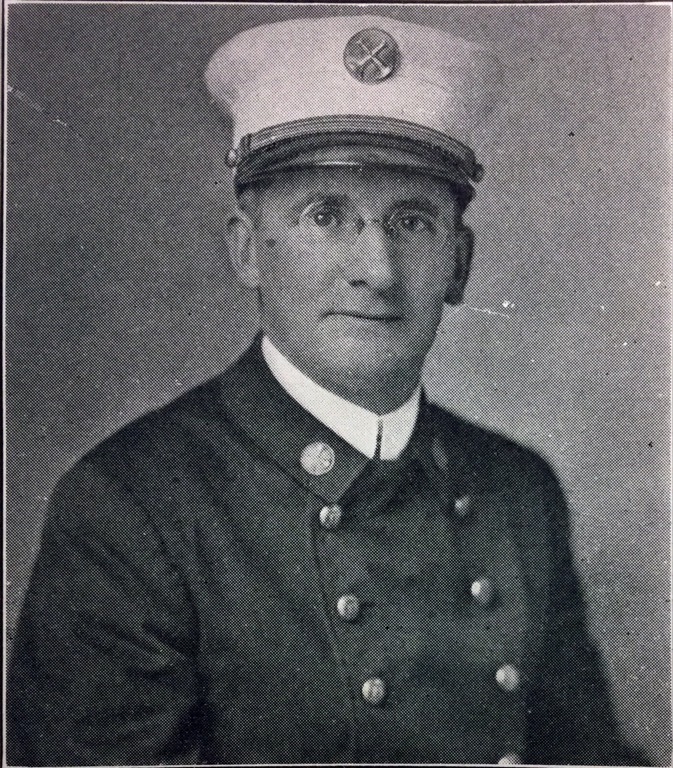 ​October 20, 1928: Engine Company 13 is established and put in service at a new two bay firehouse on Twenty Third Avenue. A new Ahrens Fox 1000 GPM pumper is put in service. 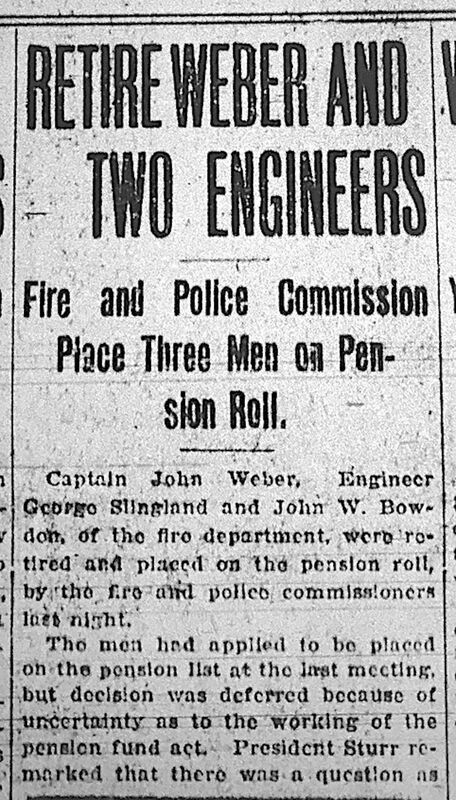 October 20, 1928: 5:30 PM The first ever 4th alarm signal was transmitted from Station 18 (Straight and Governor Streets) at 5:30 PM for the Consolidated Brewery fire. 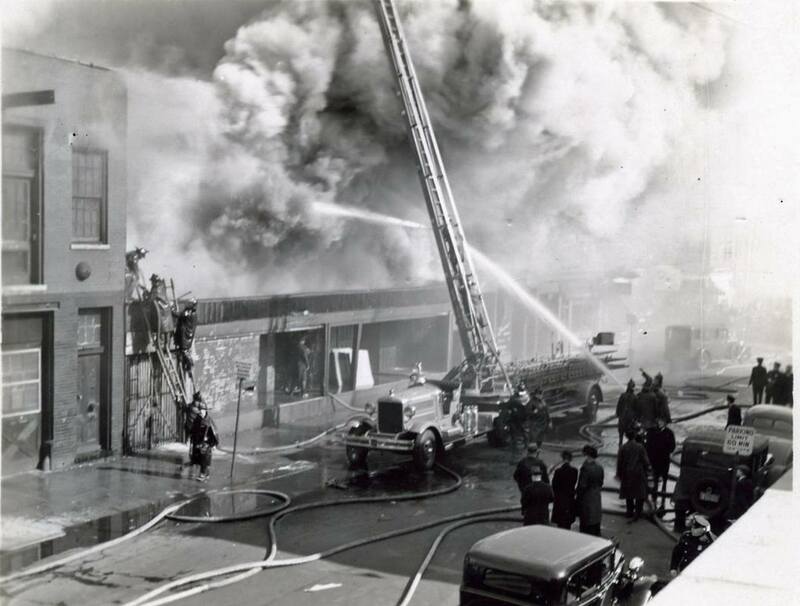 Prior to this, if needed a General Alarm was transmitted after a 3rd alarm. 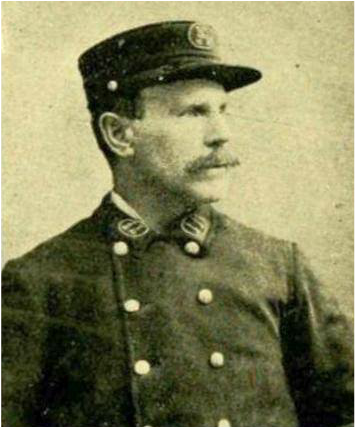 Henceforth a General occurred after a 4th alarm. 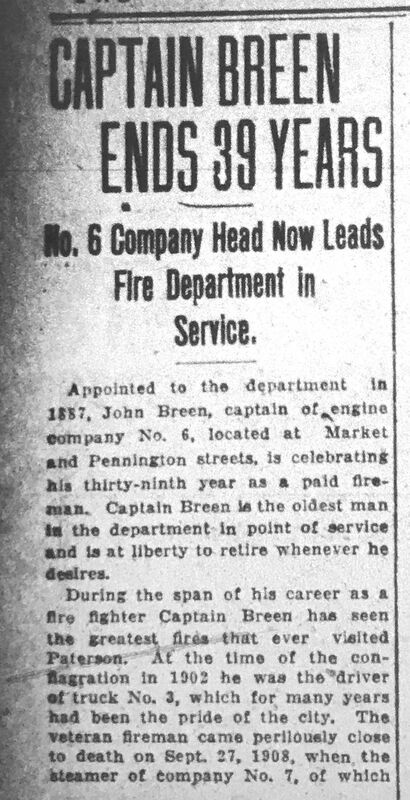 June 27, 1929: A new Ahrens Fox 1000 GPM pumper is acquired for Engine Company 6 on Market Street. 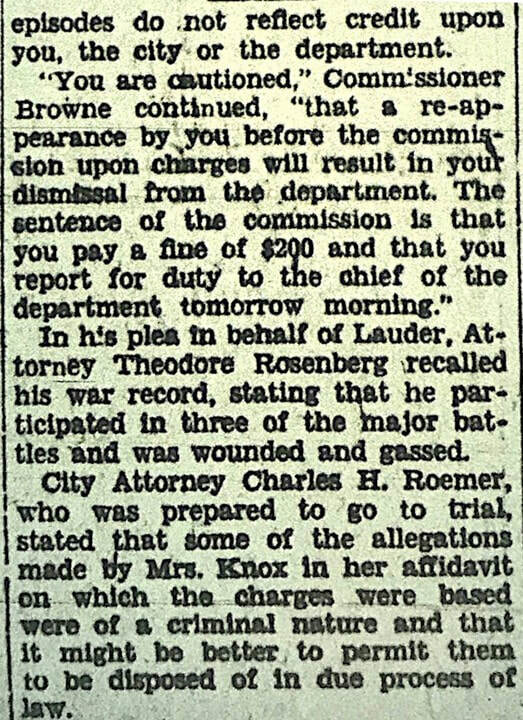 April 5, 1930: FF Watson Lauder convicted and fined for conduct subversive of good discipline (philandering). 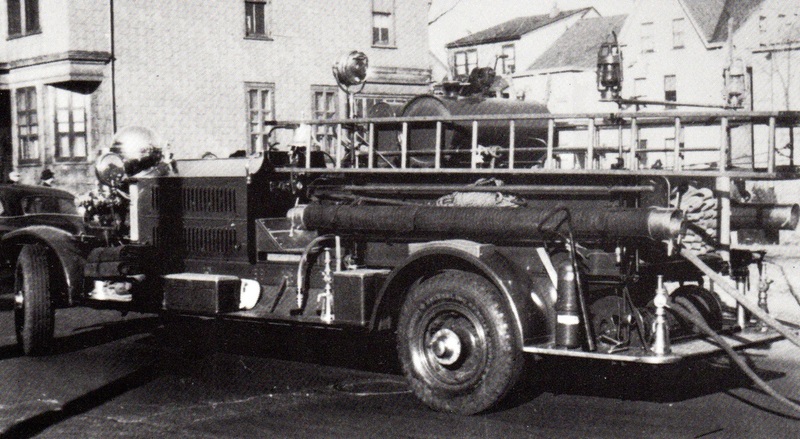 April 15, 1930: A new 85' Ahrens Fox Aerial enters service as Truck Company 2 at 115 Van Houten Street. The rear of the tractor had solid rubber tires. April - November 1930: Four new Ahrens Fox 1000 GPM pumpers acquired and assigned to Engine Companies 2, 1, 7 and 9 (shown left to right below). 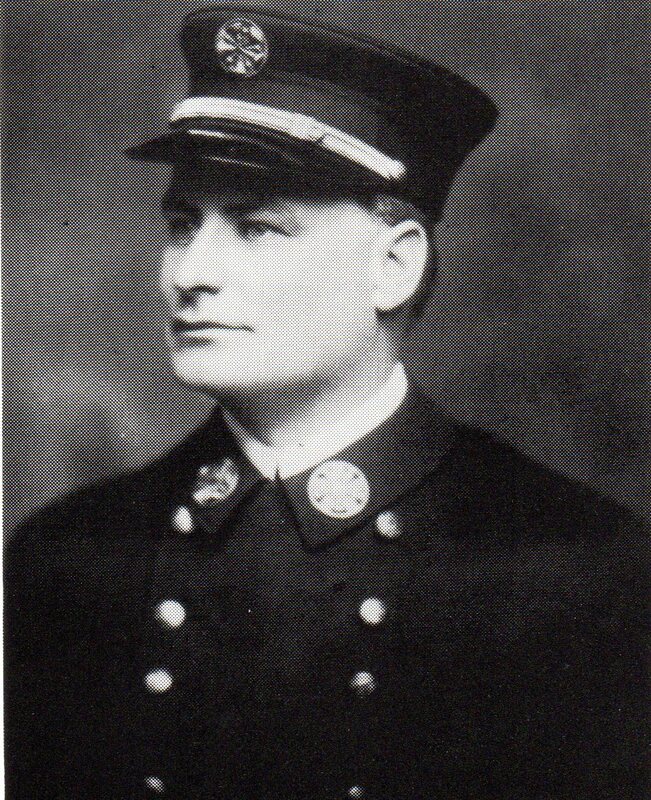 April 2, 1931: Fireman David Johnstone of Engine Company 8 dies after being struck by a car while carrying a hose at the Manhattan Hotel Fire on March 31, 1931. 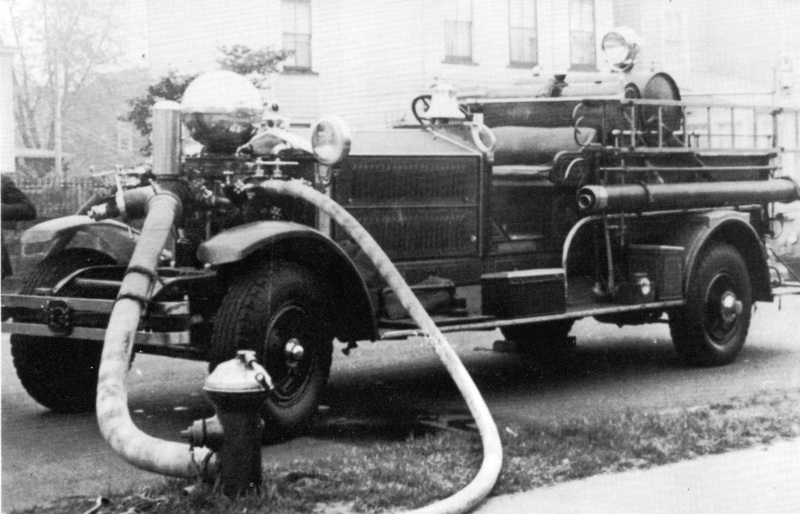 July 16, 1931: The last of the Ahrens Fox pumpers is purchased and assigned to Engine Company 10. 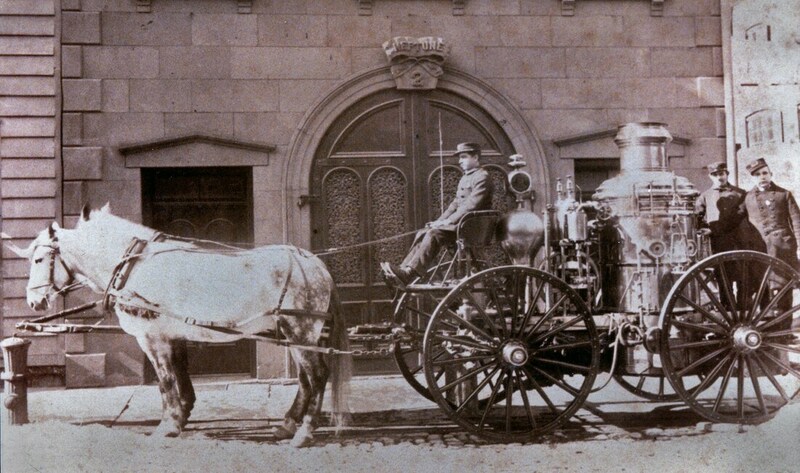 The last steam fire engine in service is retired. 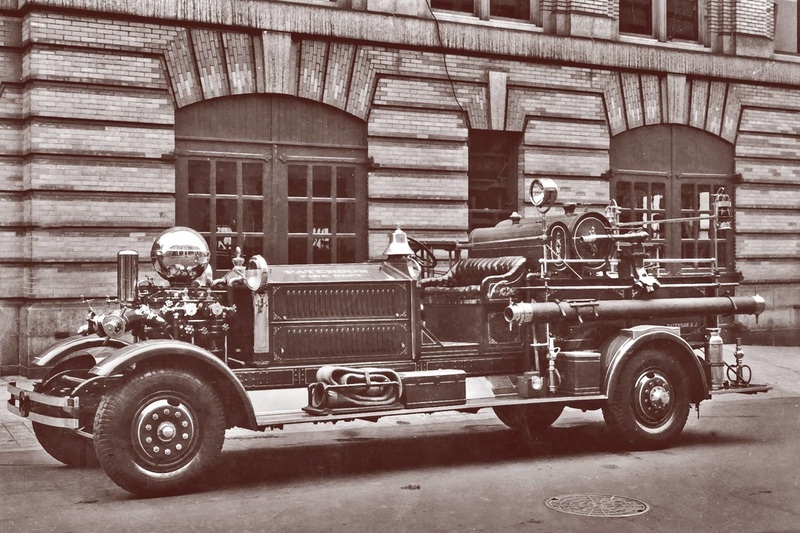 January 14, 1932: A new 85' Ahrens Fox Aerial is put in service at Truck Company 2 at 115 Van Houten Street (as photographed below). 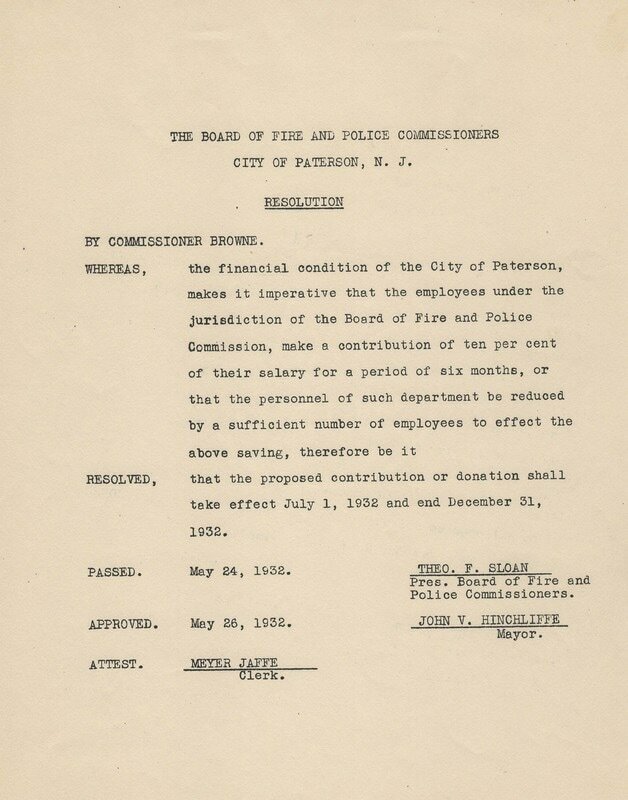 March 29, 1932: A new 75' Ahrens Fox Aerial is obtained for Truck Company 3 on Godwin Avenue and is shown below..
May 26, 1932: The Board of Police and Fire Commissioners order a 10% reduction in pay for police and firemen due to the poor financial condition of the city (Depression years). 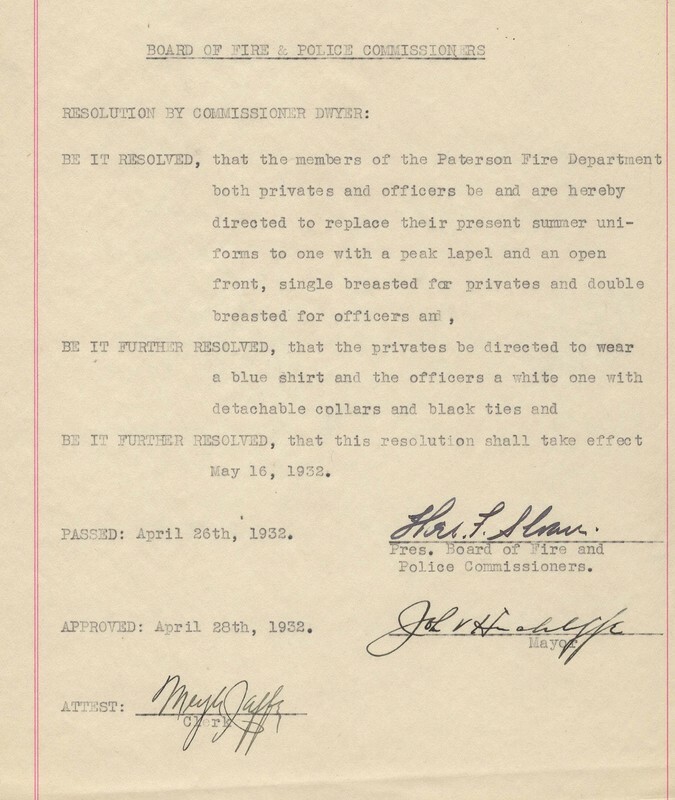 As seen below the PFD members had agreed to that in March of 1932. 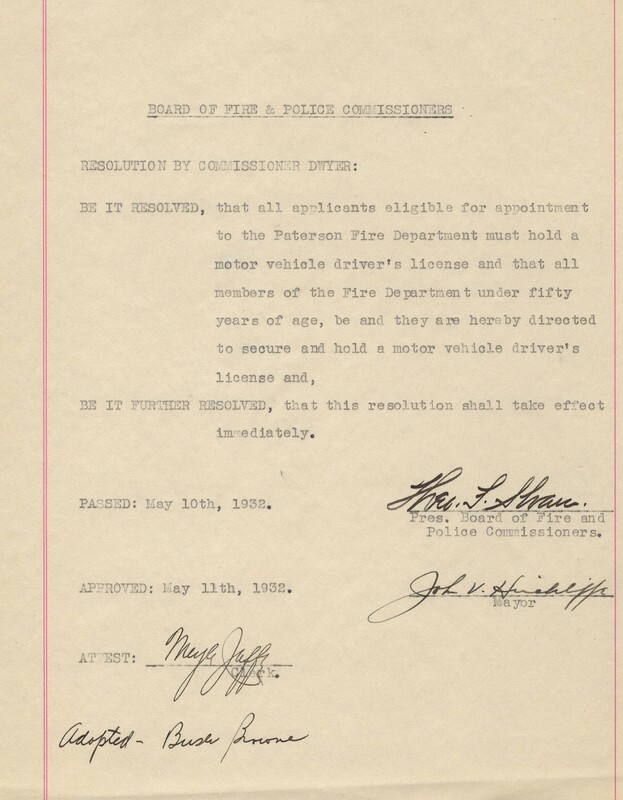 May 11, 1932: New resolution signed by Mayor Hinchliffe, mandates that all new and current firefighters under age 50 must hold a motor vehicle license. 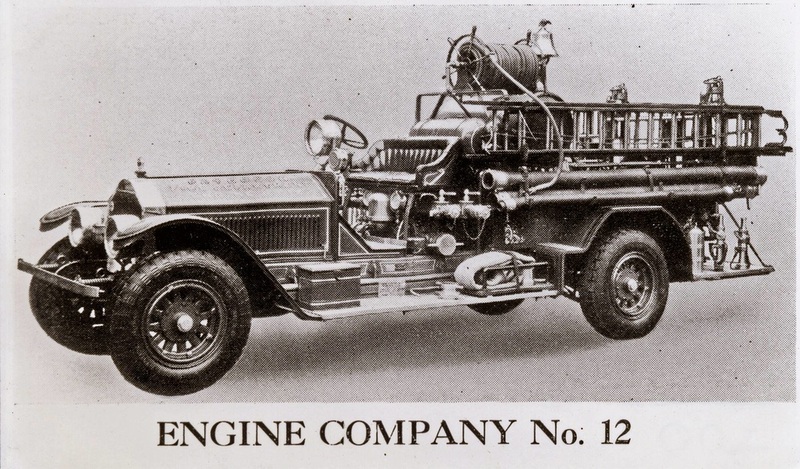 November 30, 1932: A rebuilt 1922 500 GPM American LaFrance pumper was given to the Department by the Ahrens Fox Engine Company in appreciation for past business. 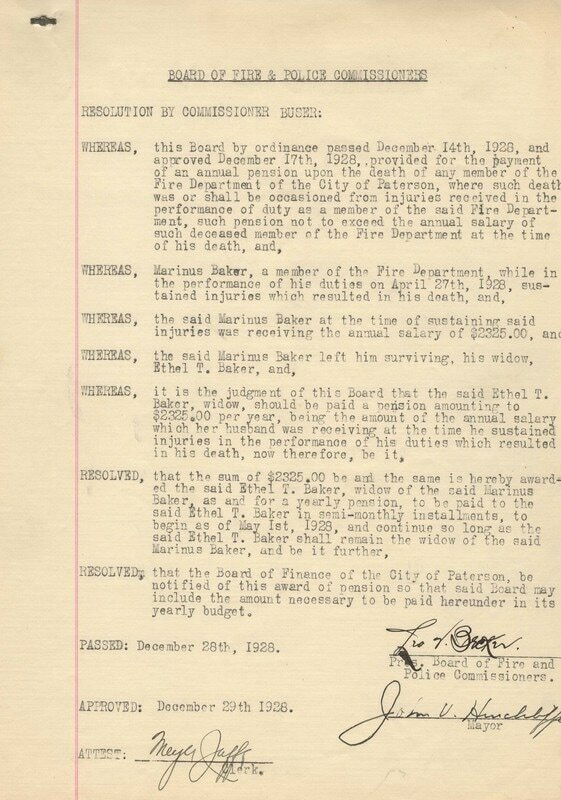 This apparatus originally belonged to Haledon, NJ Fire department where it was badly damaged in a 1931 accident. It was assigned to Engine Company 11. 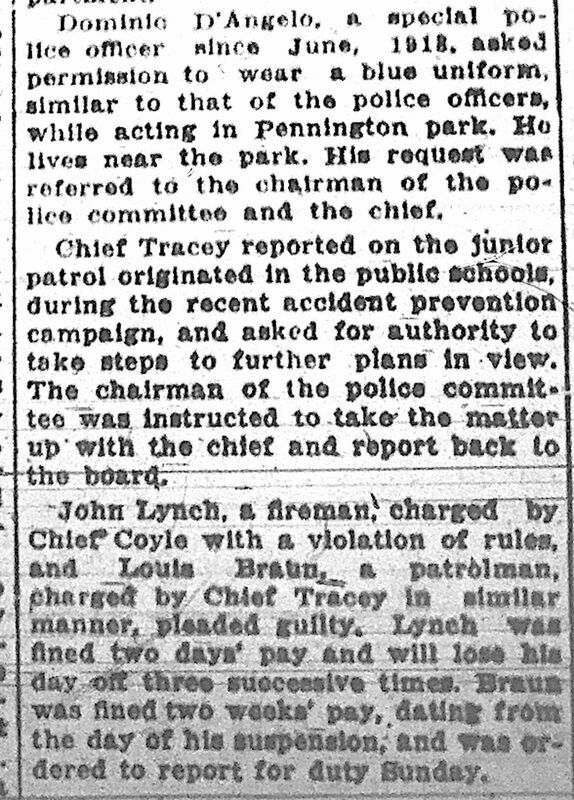 ​May 7, 1934: The St. Bonaventure's Lyceum fire fatally injures John P. O'Neill of Engine 9 (died May 8) and Allen Saal of Truck Company 3 (died May 9). Both made the Supreme Sacrifice in a wall collapse. 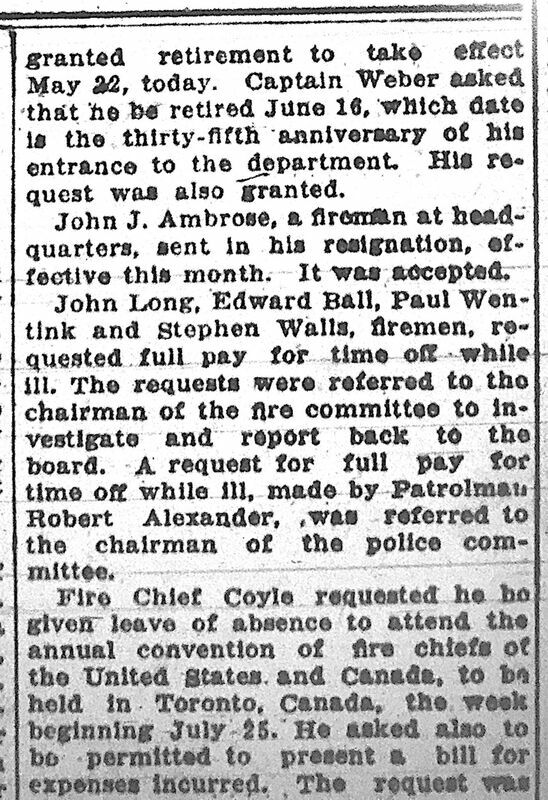 January 18, 1935: Mayor Hinchliffe statement in the 10thAnnual FMBA Ball Firemen's Booster (during the Great Depression). 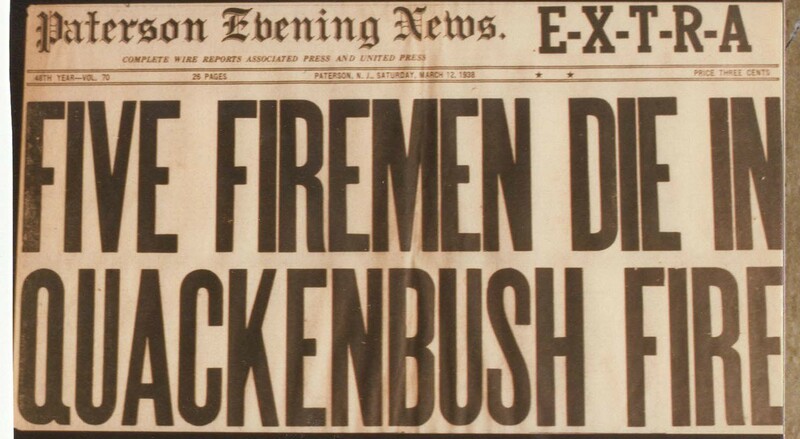 May 12, 1938: At a four alarm fire at the Quackenbush Warehouse on Prospect Street, a wall collapse killed five Paterson Firemen: making the Supreme Sacrifice were Deputy Chief James Sweeney, Captain John Devenport and firemen Louis Rodesky, Matthew O'Neill and William Lynch. 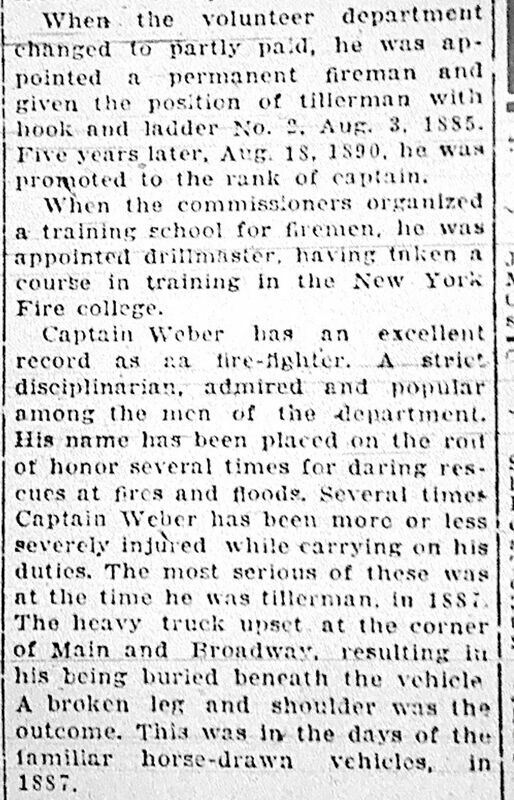 All but Sweeney were from Engine Company 5. The wreckage of the fallen wall. 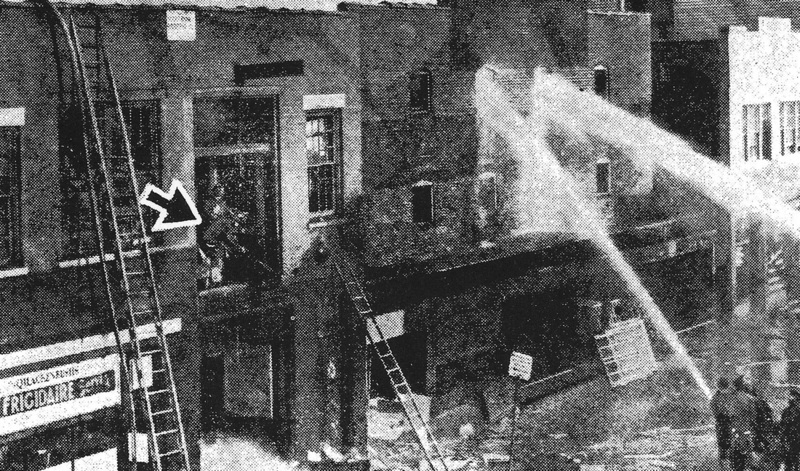 Note the Fireman's Helmet with a 5 on the shield on the middle left side of the photo. 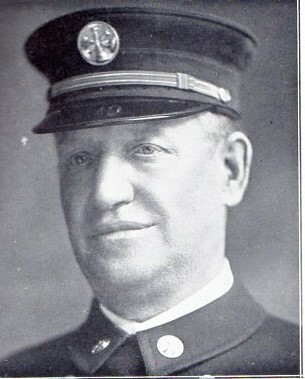 It belong to Fireman William Lynch. The hose that the men were handling is also seen. 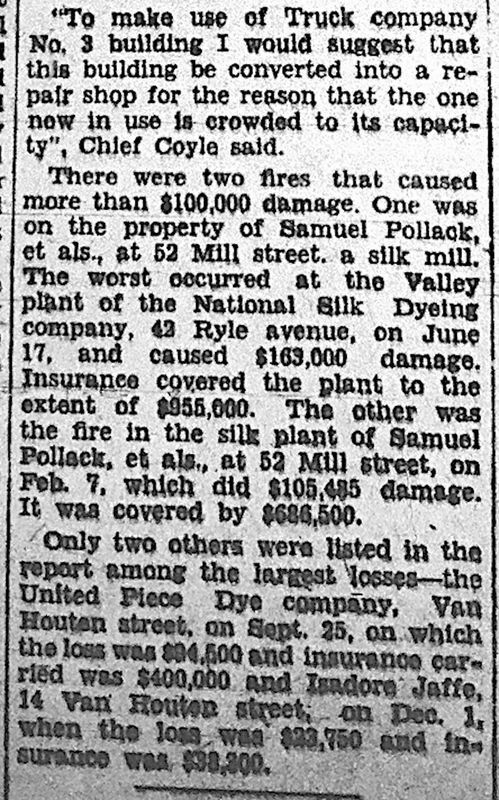 May 5, 1938: Engine 9's Ahrens Fox pumper is badly damaged in a collision with a bus-trolley in front of its Main Street firehouse. 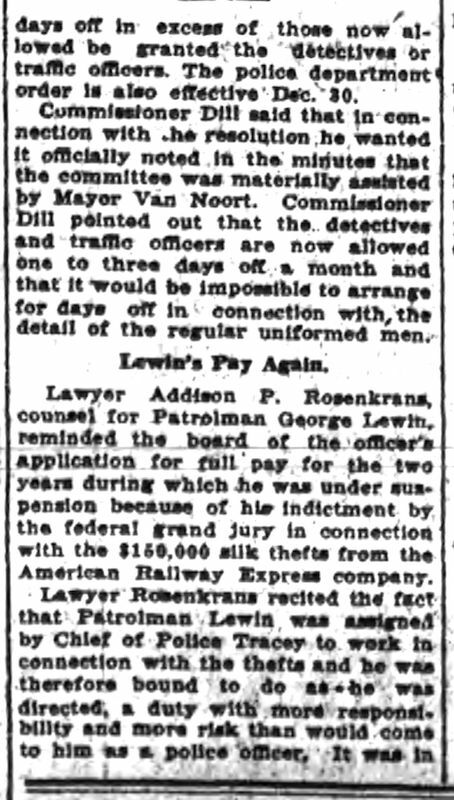 The apparatus had to be shipped back to the Ahrens Fox Company for repair (Click here for full story). 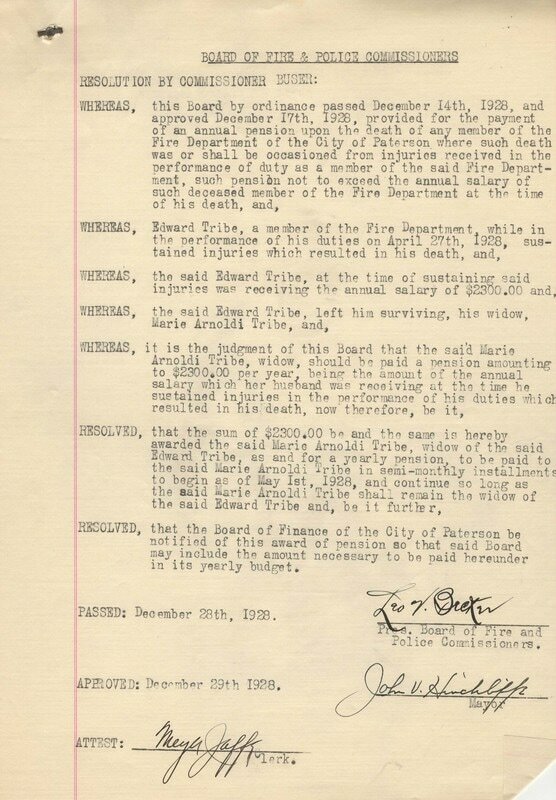 October 13, 1938: Popular FF of Engine #13. 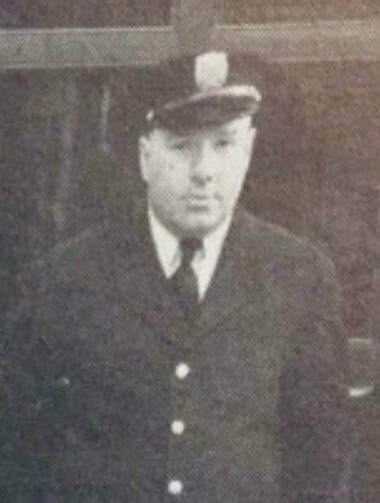 FMBA officer and veteran Elmer Probert dies at young age. 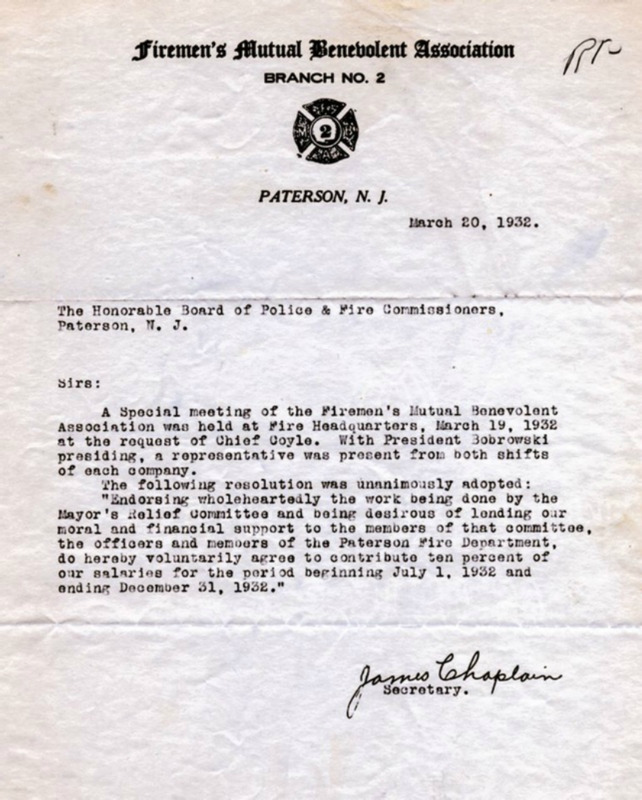 Two brothers George T. and Howard F. were also Paterson firefighters.